The DRL has developed a Simulcast technology which, in real time and with a single Client, allows users to select and view quicklook instrument data from multiple missions and spacecraft. 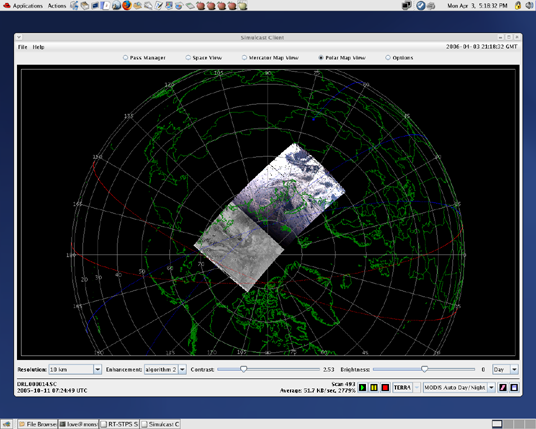 Simulcast is a standalone, Java-based technology that provides real-time geolocation and pseudo-calibration, and projects data on Mercator and Polar maps. The Simulcast Client features an Auto Day/Night mode to allow passes near a pole to be viewed in TrueColor mode during the day portion, and Infrared mode during the night portion. The Client can also export displayed images to JPEG format. Simulcast can replay recent satellite passes. Simulcast is scalable and capable of supporting many users, both local and remote. 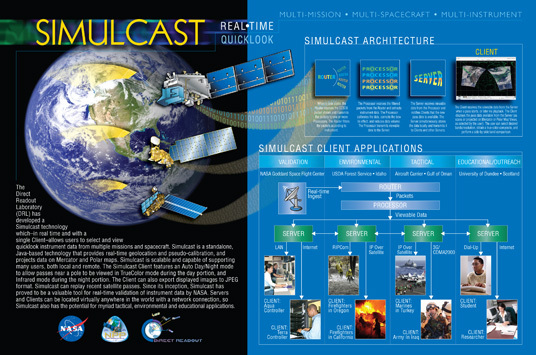 Since its inception, Simulcast has proved to be a valuable tool for real-time validation of instrument data by NASA. Servers and Clients can be located virtually anywhere in the world, so Simulcast also has the potential for myriad tactical, environmental and educational applications. Click here to download the latest version of the Simulcast package for either Linux or Windows. The Simulcast Client consists of the Simulcast Viewer and the Simulcast Console. 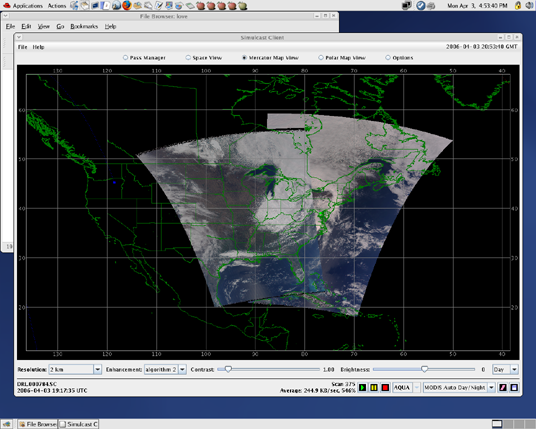 The Viewer displays data from satellite passes (VIIRS data from NPP, and MODIS data from Aqua and Terra). The Console displays and controls administrative information. Before data can be displayed with the Viewer, the data must first be acquired, routed and processed by Simulcast Services. Simulcast Services contains the Simulcast Router, Processor and Server. When a pass starts, the Router receives the Consultative Committee for Space Data Systems (CCSDS) packet stream from the Real-time Software Telemetry Processing System (RT-STPS) and transmits the packets to one or more Processors. The Router filters the packets by instrument type. The Processor receives the filtered packets from the Router and extracts instrument data. The Processor calibrates the data, corrects the bow tie effect, and reduces data volume. The Processor transmits viewable data to the Server. The Server receives viewable data from the Processor and notifies Clients that the new pass data are available. The Server simultaneously stores the data locally (for possible replay later) and transmits it to Clients and other Servers. A Server can handle connections from multiple clients simultaneously, with each Client either receiving the data from the current pass or from a previous pass.